Even though a ribbon is quite a handy material for crafty projects, some might still be a bit indecisive about the type of ribbon to use. There are many types of ribbons to choose from. The best way to do so is by knowing the characteristics of each of them and selecting the one that is perfect for your DIY project. This is perhaps the most popular type of ribbon. In fact, when you hear the word ribbon in general, a lot of people would first think of satin ribbon. It’s a polyester material, available in many colors and different shades. It’s soft and it can be made from silk, cotton or nylon. It can be single or double-faced with a very smooth surface. Satin ribbon is commonly used for gift wrapping, home decor, or accessories. Apart from a wide range of colors, satin ribbon also comes with a variety of different patterns and designs. This type of ribbon is more durable because of the woven fibers that make grosgrain ribbon. It’s firmer than the satin ribbon, but yet elastic enough to make it quite suitable for many different projects, such as home decor, hair accessories and other DIY projects, etc. It’s available in many different colors, sometimes with interesting patterns and designs. Velvet ribbon is a soft kind of ribbon and it’s usually one-faced ribbon, which means that one side will be soft, velvety, while the underside is plain. Due to the plush texture, this ribbon demands special care. This is an elegant type of ribbon, once made from silk, but this made it quite an expensive material. This is why now chiffon ribbon is mainly made from polyester. It’s also known as organza ribbon, but this name is usually used for wider pieces. The material is tender, light and silk-like. It’s perfect to use it as a base and combine with other types of ribbons, especially with satin ribbon. It’s suitable for many projects such as hair and clothing accessories, gift wrapping, venue decoration, etc. 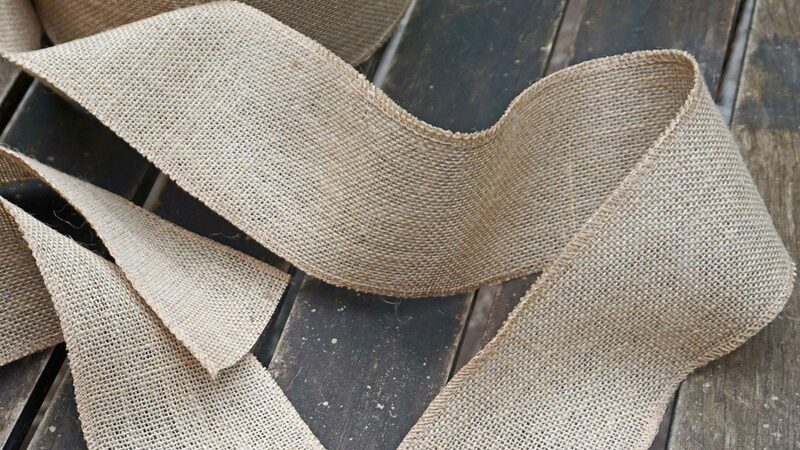 Burlap ribbon is a sturdy material made of woven cloth such as fibers of jute or flax. It can also be made from hemp fibers, in which case the material is a bit softer. It comes in many different widths and it’s perfect for outdoor projects. It’s usually brown, but there are other colors available as well. Burlap gives that rustic, antique look and it can be painted/printed on. Crepe ribbon looks like a crepe paper, hence the name. It’s quite soft material that looks a bit wrinkly. The ribbon edges are usually sewn on each side. This is done to prevent any loose ends, but it does make the material more rigid that it really is. This type of ribbon is perfect for gift wrapping, flower decoration, etc. The material used for ruffle ribbon is similar to the one used for organza and chiffon ribbon. It’s light and soft, usually quite thin and see-through. The main distinction is that it’s ruffled. There are two kinds of ruffled ribbons. It can be stretchable, in which case the elastic is sewn onto it to make it stretchy. It can also be non-stretchable in which case the ruffle is made with regular thread. Mesh ribbon looks like a sort of a net. The fibers can be quite close with small holes between them, or they can be quite wide apart. Different colors of mesh ribbon are available on the market, and it’s available in different widths. It’s great for clothing when combined with other materials, as well as for flower decoration. It’s a plain woven fabric, usually made from silk. It looks quite similar to the satin ribbon, which is why people often mix the two. However, the silk is more durable and less delicate than satin. Like satin, it’s popular in the fashion industry, decor, etc. Since silk is more expensive than satin, taffeta ribbon is also more expensive. This type of ribbon is considered to be quite durable. It has the same pattern on both sides, which makes it quite unique, although the color can be a bit different. Due to its durability, this is a high-quality ribbon, perfect for all sorts of crafting projects. It’s available in many different colors, sometimes with embroidery. The main characteristic of this kind of ribbon is the fact that it’s lined with small twisted loops. This make picot edge ribbon quite handy for decorating. The actual material used for picot edge is most commonly satin. Twill tape is a twill-woven ribbon, in a diagonal or zigzag form. This kind of weave provides quite sturdy material. 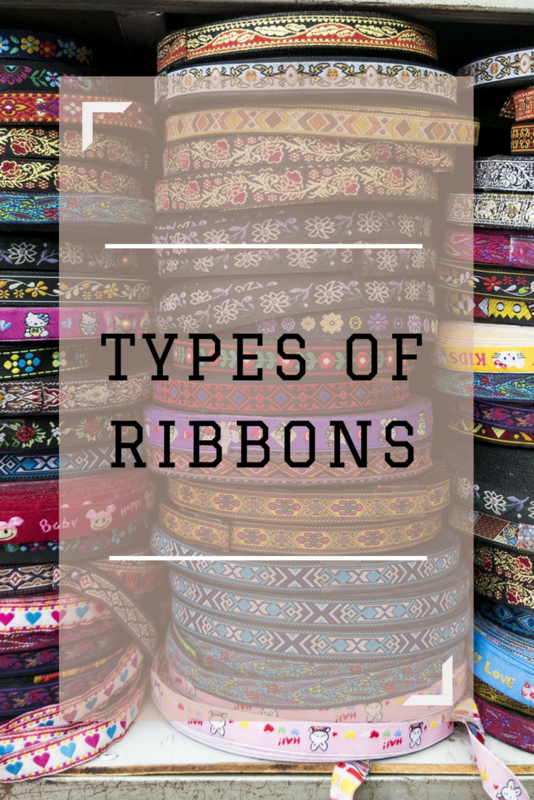 Since this type of ribbon is usually used for binding, as well as for sewing and tailoring of edges and seams, it’s usually available in plain colors and the palette of colors is pretty limited.